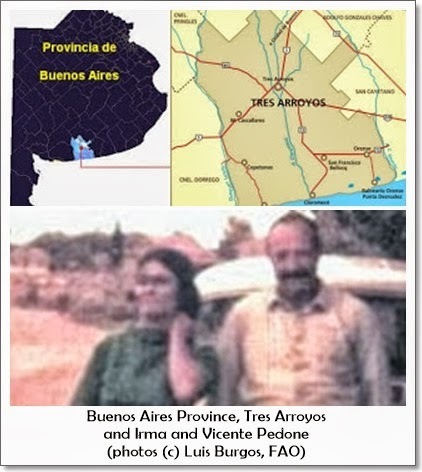 Tres Arroyos, located over 600 km south of Buenos Aires, shall henceforth not only be known as the “national wheat capital”, as many of you will remember it as being the location in the province of Buenos Aires where the “first humanoid encounter in the country” took place. In early 1971, in the full bloom of summer, I had the chance to spend the season in Orense, a lovely beach community which, along with Reta and Claromecó, constitute the main tourist attraction of the holiday season in Tres Arroyos. Logically, as I was only taking my first steps in field research, my conversation had mostly to do with the subject. So, between anecdotes and reminiscences, my mind was stirred. The agent was Mr. Vicente Pedone, my host at the time. According to Don Vicente, in the early 1940s, he was serving as a sergeant with the Buenos Aires Provincial Police and performed his duties in this area: Orense, San Cayetano, Copetonas, Oriente, Cristiano Muerto, etc. – communities he came to know very well. One night, while in the company of Officer Elias Gitani at a field depot, a local boy approached them hurriedly, claiming to have seen “an airplane in flames, deep in the fields”. Faced with this startling claim, Vicente and his subordinate reported to the crash site, accompanied by the young man (whom I will refer to as NN, given his anonymity). After covering a significant distance in the police car, their guide pointed out the possible impact site: There, some 200 meters away from the group, near a hill, was an exceedingly strange, glowing, disc-shaped object, which remained on the ground and in their sight. Surrounding the object was an undetermined number of figures that “came and went”. At a distance, these being appeared to be very tall, clad in seemingly metallic and luminous outfits. They moved slowly and they carried in their hands what looked like “mugs”. We must imagine such a sight in the early 1940s. This sight so startled the onlookers that they wisely retreated to a safer distance. But their surprise and nervousness increased when Don Vicente tried to start the vehicle. One, two, three attempts, with negative outcomes. Therefore, and rather than running across the field, they all agreed to remain within the police car. “We were left to our fates,” the protagonists of the incident remarked. After several minutes, they saw that the false aircraft was moving backward in a slow, even movement, always level with the ground. This action caused Vicente to try and start the car again, as the passing minutes were becoming endless. The engine finally turned over and they were able to make a hasty escape, bring an end to the evening, which would endure in their memories. It is a shame that they were unable to see the final phase of the phenomenon. The next morning, Don Vicente heard from NN that patches of burned grass were in evidence at the landing site in Orense. This, unfortunately, was not confirmed in situ by the policemen, thus leaving NN’s account as the sole, eloquent account of that physical evidence. As the modern era of the UFO phenomenon starts with the Kenneth Arnold sighting in 1947, the word “flying saucer” had not yet been coined, and mysterious events in the countryside were described as “La Luz Mala” (the Evil Light) and with stories of ghosts, wandering spirits, etc. At least in Argentina there were no accurate accounts of UFO occupant encounters. It is for this reason, I classify this notable incident as Argentina’s First Close Encounter of the Third Kind, relegating the case of Wilfredo Arévalo and his son, which occurred on 18 March 1950 near Lago Argentino, Province of Santa Cruz, to second place. The case became widely known, but the witnesses…were never found! As with all humanoid behavior, which looks absurd from a human perspective, there is no clear concept in this case as to why the craft landed. If we hold to the first words spoken by NN about “an aircraft in flames”, we would have no other interpretation but to imagine an accident or breakdown experienced by the object in flight as the real cause of the emergency. Given the time period, NN would have hardly thought to use another phrase to classify his sighting. There is no doubt that he was confused by the magnitude of the light given off by the artifact as it descended. Proof of this could be the fact that no sooner had they come within an average distance of the landed craft, the police car suffered the effects produced by the magnetic field (EM effect). This would imply that the UFO was mostly intact or at least without any serious apparent consequences. But this definition would not explain the true causes of the landing and exit of its crew. Moreover, the backward motion of the vehicle, scant centimeters over the ground, is striking, since there aren’t many episodes of this nature that allow us to engage in “Comparative Ufology”, which is always valuable. Yet there is always a background incident, and I have remembered it as though it were yesterday, as I had the chance to speak personally with the witnesses. It took place in the town of Las Juanitas, in western Buenos Aires province, in 1957. Several members of the Leali family were about to cross a field in the early hours of the morning, after having taken part of a meeting. At a distance of some 200 meters, they saw that the mill next to their house, which formed part of the train station itself, was surrounded by “strange people” dressed in white outfits, trying to enter a luminous vehicle located right on the train tracks! At that moment, they remembered a sort of “wave of warm air” reaching them. The object began to move backwards very slowly over the train tracks until it vanished from sight, without ever flying away. These are, evidently, two events in Buenos Aires Province from a long time ago, with enticing accounts from trustworthy stories, although oddly enough, the coming years would offer no comparable situations. Are you aware of any similar incidents?